• Install KEYpak on your system. • Remove all components of the existing KEYpak. See the following pages for running the SETUP program. 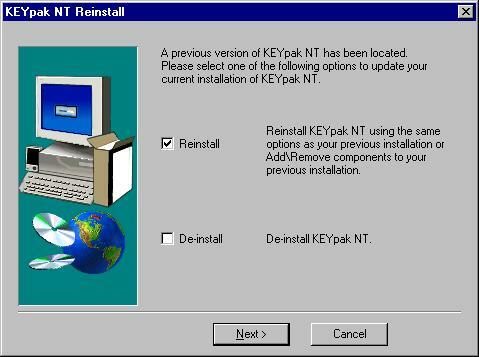 KEYpak runs on the Windows NT / XP operating system. A full installation of KEYpak requires approximately 10.5MB of disk space. 1. Insert KEYpak Installation Disk 1 into a floppy drive. 2. 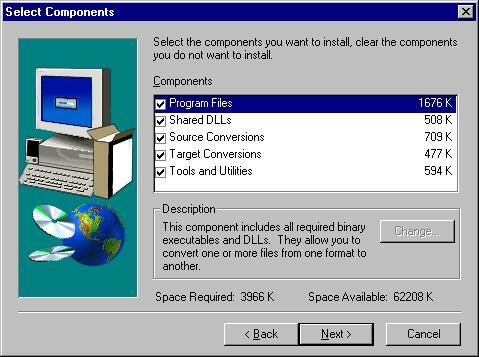 For Win NT 3.5/ Win 3.51: from the Program Manager, choose Run from the File menu. Enter the full path of the KEYpak SETUP program (for example A:\SETUP). Follow the on-screen instructions. 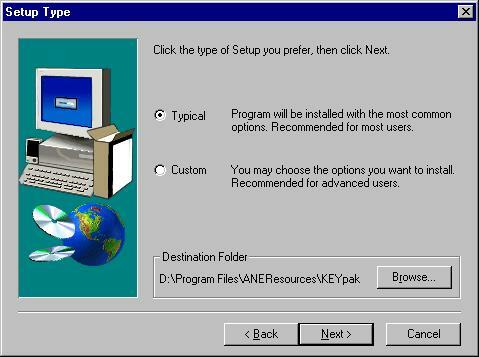 For Win NT 4.0/ Win XP: from the Start Menu; choose Run. Enter the full path of the KEYpak SETUP program (for example: A:\SETUP). Follow the on-screen instructions. 3. If you are installing KEYpak for the first time, the KEYpak Registration window will appear. Enter the required information. The SETUP will prompt you to confirm the entered information. 4. The SETUP program will now display the KEYpak NT Setup screen. If SETUP detects another version of KEYpak installed on your system, it will ask whether you want to Reinstall or Remove All. Click Reinstall to continue. 5. When SETUP is ready to install KEYpak, it will display the KEYpak - Setup Type window. Select the installation type of your choice and follow the on-screen instructions. From the KEYpak - Setup Type window, select the installation type of your choice. Select this option if you want to install the complete KEYpak product including all converters and other components provided with your installation. Select this option if you want to install KEYpak converters and other components of your choice. 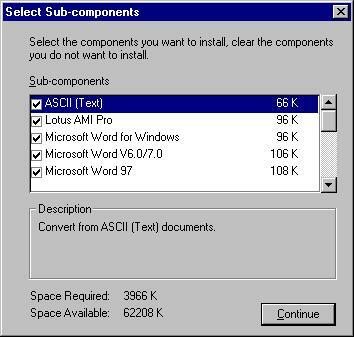 If you choose Custom from the Setup Type window, the Select Components window will appear. The Components list box shows the groups of KEYpak features which you can install. When you highlight a component, its description will be displayed in the Description box. Click the check boxes to select which ones you want to install. Note To run KEYpak as a stand-alone program, Program Files and Shared DLLs from the Components list must be selected. You can further customize which parts of a group to install by highlighting it in the Components list, then clicking Change. The Select Sub-Components screen will appear showing you the parts, their function, and allowing you to select or deselect them for installation. Select/deselect from the Sub-components list box and then click Continue to proceed with the installation. Run the KEYpak SETUP program as described in the section Running SETUP. If KEYpak is already installed on your system, the SETUP program will ask whether you want to remove it from your system. Click De-install to continue. Use the Add/Remove Programs in the Control Panel. The SETUP program will delete all files related to KEYpak.